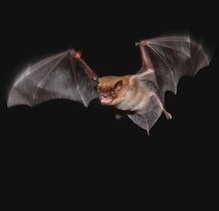 COLLEGE PARK, Md.— Look up into the sky at dusk this spring and you’re likely to see small groups of bats flitting here and there, gobbling up their insect meals in an intricately choreographed aerial dance. It’s well known that echolocation calls keep the bats from hitting trees and each other. But now scientists have learned some bats emit another call: one that tells their comrades to “back off” from bugs they’ve claimed for themselves. Led by Biology Research Associate Genevieve Spanjer Wright, a team of five researchers from the University of Maryland, including Cynthia Moss of the Clark School's Institute for Systems Research, found that male big brown bats can produce a special sound, called a “frequency-modulated bout” (FMB), that tells other bats with whom they are foraging to keep away from their prey. The Maryland researchers are the first to report this ultrasonic social call produced exclusively by flying, foraging male big brown bats. While some animals that forage in groups are known to emit calls to attract others towards food sources, the FMB is used to repel, not attract, other bats. The researchers discovered only male big brown bats emitted the FMB, possibly to advertise their dominance or claim their territory. Female bats did not emit FMBs. One possibility why is that females form close associations with their roost mates and may forage near individuals familiar to them, while males often roost alone or in small bachelor colonies and may be more unfamiliar with those with whom they forage. Wright is a University of Maryland alumna (2012 Ph.D. Biology) who was advised by Gerald Wilkinson and Cynthia Moss of the Clark School's Institute for Systems Research (ISR). Psychology/ISR Postdoctoral Researcher Chen Chiu, the manager of the University of Maryland Auditory Neuroethology Laboratory, is also part of the research team. Chiu is an alumna (2008 Ph.D. NACS) who was advised by Cynthia Moss. Other team members include Auditory Neuroethology Laboratory Research Assistant Wei Xian, Professor Gerald Wilkinson (Biology), and Professor Cynthia Moss (Psychology/ISR). Movie S1: Animation showing an increase in interbat distance following FMB emission as two males compete for prey (Movie S1 is related to Figure 3.) In this movie, the two bats are represented by different colors, red and blue. The bats’ movements and vocalizations have been slowed by a factor of 10. The top graph in the movie traces the bats’ movements around the flight room. Each circle on the bats’ paths indicates a vocalization. The FMB vocalizations are indicated in green. The prey item is a tethered mealworm in the center of the room, represented by a yellow circle. The bottom graphs show characteristics of the bats’ calls. The first graph represents the time between vocalizations, the second is the duration of each call, the third is the frequency (pitch) of the call. The FMB calls are shown in green. The red bat emits FMBs around 00:07, 00:24, and 00:59 and initiates a feeding buzz and attack on the prey item (yellow circle) around 01:06. Notice the distance between the two bats is greater after the red bat emits the FMBs.